Official dedication ceremonies held on Thursday, October 28, 1886. Total overall height from the base of the pedestal foundation to the tip of the torch is 305 feet, 6 inches. Height of the Statue from her heel to the top of her head is 111 feet, 6 inches. The face on the Statue of Liberty measures more than 8 feet tall. A tablet held in her left hand measures 23' 7" tall and 13' 7" wide inscribed with the date JULY IV MDCCLXXVI (July 4, 1776). There are seven rays on her crown, one for each of the seven continents, each measuring up to 9 feet in length and weighing as much as 150 pounds. At the feet of the Statue lie broken shackles of oppression and tyranny. The Statue of Liberty is located on Liberty Island, in the New York harbor, USA. The Statue of Liberty commemorates the American Declaration of Independence and was a gift from the people of France. The statue was assembled on its pedestal after being constructed in France and sent to the US in crates. It was dedicated on October 28, 1886. The Statue of Liberty was designed by French sculptor Frederic Bartholdi. The female form represented by the sculpture is based on Libertas, the Roman goddess of liberty. She holds a torch and a tabula ansata (tablet) that has the date of the American Declaration of Independence inscribed in it (July 4, 1776). A broken chain also lies at the feet of the statue which is hard to see from the ground. The official name of the Statue of Liberty is ‘Liberty Enlightening the World’. The statue has been closed for renovation a number of times, including between 1984 and 1986 when the torch and much of the internal structure was replaced. 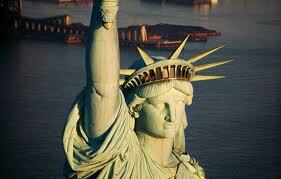 The Statue of Liberty stands 151 feet (46 metres) in height, and 305 feet (93 metres) from the ground to the torch. The head of the statue was displayed at the World's Fair in Paris, 1878. There was difficulty in the United States finding money to fund the project, especially after a financial crisis in 1873. A fundraising drive led by newspaper publisher Joseph Pulitzer was embraced by New Yorkers and helped push work forward. 80% of the donations were of less than $1. Liberty Island was previously called Bledloe's Island. There are replicas of the Statue of Liberty found in Paris, Las Vegas and many other cities around the world.